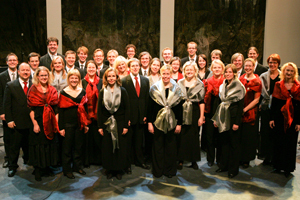 The Helsinki Chamber Choir was founded in 1962 as the Finnish Radio Chamber Choir. It assumed its current name in May 2005, when the Finnish Broadcasting Company, YLE, withdrew its funding. Since then, the Choir has maintained an independent presence as Finland's only choir made up of professional singers (excepting the Chorus of the Finnish National Opera) and has continued to perform the most demanding works in the contemporary choral repertoire. The Choir regularly commissions new works, mostly from Finnish composers, and its performances are still regularly broadcast by YLE. Throughout its history, the Finnish Radio Chamber Choir was led by Harald Andersén, Ilmo Riihimäki, Eric-Olof Söderström, Timo Nuoranne and Finnish composer Kimmo Hakola, who remained Artistic Director with the Helsinki Chamber Choir until June 2007. The current Artistic Advisor of the Helsinki Chamber Choir is German conductor Nils Schweckendiek. The Choir has also worked with foreign guest conductors such as Eric Ericson, Tõnu Kaljuste, Peter Phillips and Paul Hillier.